Hot apple cider is the quintessential drink for the fall season -- especially on a crisp morning or chilly evening. I saw these adorable apple cups on Pinterest, and I knew our delicious homemade apple cider would taste and look even sweeter when served in this simple, yet clever, edible no-waste "cup." 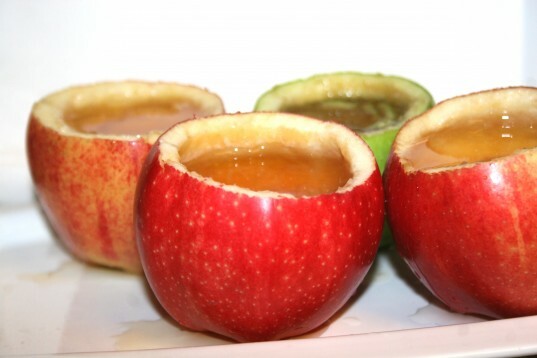 Apple cups are easy for a child to grasp, and they hold the perfect small serving of hot cider. They also offer a festive twist on serving ware for fall gatherings. The best part is -- if you mess up making your apple cup, you just toss the apple into the cider you're making and try again! 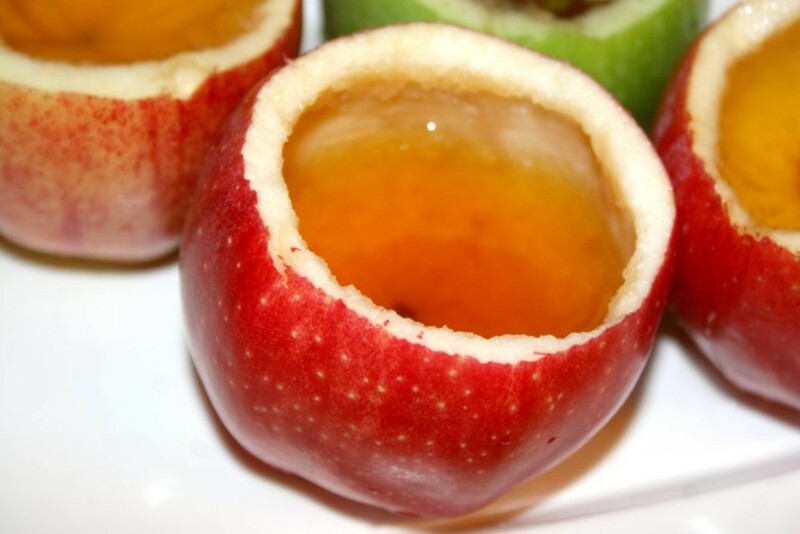 Keep reading to learn how to make this easy homemade organic apple cider served in apple cups. 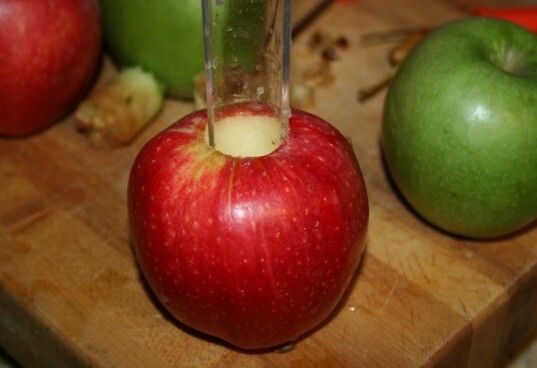 Insert an apple corer into the middle of the apple and take out the stem and seeds. *Seeds or stems won’t hurt the cider, but I like to use the leftover apples to make applesauce. If you are making apple cups, use a peeler to clean out the inside of the apple. Then use the pumpkin carving tool to even out the edges of the apple and add water to the cups to prevent browning. 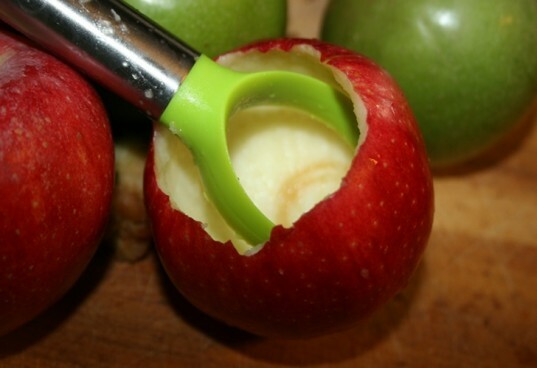 If you are skipping the cups, it is still great to use the peeler instead of cutting the apple into slices. They cook much faster as peels. Add the apple peels to a large pot and cover slightly with water. Then bring to a hard boil. After the apples reach boiling, reduce to a simmer and cook covered for 2 hours. Using a whisk, potato masher, or large spoon, mash the apples into a pulp. Then let the mix cool. Using a strainer, cheese cloth, or T-shirt, strain the cider into a bowl. I like chunks of apple in my cider, so I used a strainer. If you prefer just a smoother cider, use a cheese cloth or T-shirt and drain all of the juice into a bowl. You can then add cinnamon or other spices to taste, reheat, and serve in your apple cups. Store remaining cider in glass jars. You can use the remaining apples for applesauce. Insert an apple corer into the middle of the apple and take out the stem and seeds. 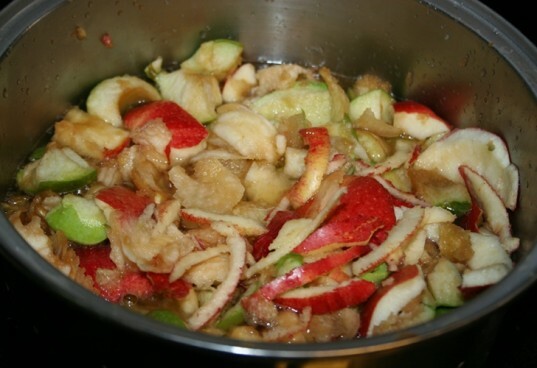 *Seeds or stems won’t hurt the cider, but I like to use the leftover apples to make applesauce. If you are making apple cups, use a peeler to clean out the inside of the apple. Then use the pumpkin carving tool to even out the edges of the apple and add water to the cups to prevent browning. 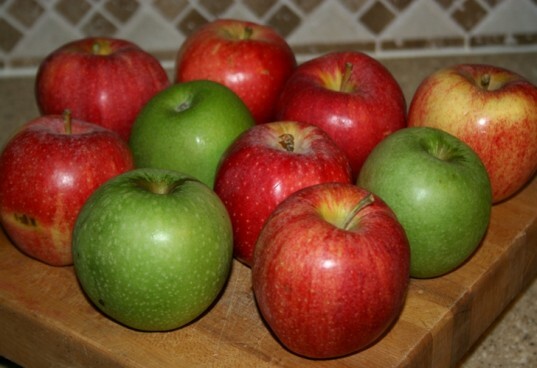 If you are skipping the cups, it is still great to use the peeler instead of cutting the apple into slices. They cook much faster as peels. Add the apple peels to a large pot and cover slightly with water. Then bring to a hard boil. After the apples reach boiling, reduce to a simmer and cook covered for 2 hours. Using a whisk, potato masher, or large spoon, mash the apples into a pulp. Then let the mix cool. Using a strainer, cheese cloth, or T-shirt, strain cider into a bowl. I like chunks of apple in my cider, so I used a strainer. If you prefer a smoother cider, use a cheese cloth or T-shirt and drain all of the juice into a bowl. You can then add cinnamon or other spices to taste, reheat, and serve in your apple cups. Store remaining cider in glass jars. You can use the leftover apples for applesauce. Insert an apple corer into the middle of the apple and take out the stem and seeds. 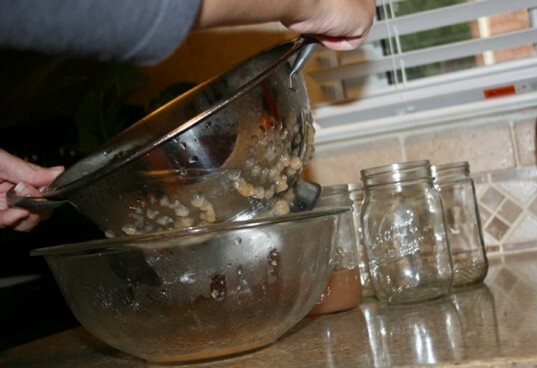 *Seeds or stems won't hurt the cider, but I like to use the leftover apples to make applesauce. variety of organic apples (10 will get you about 32 oz of cider) apple corer fruit peeler pumpkin carving utensil strainer, cheese cloth, clean tee shirt Insert an apple corer into the middle of the apple and take out the stem and seeds. *Seeds or stems won't hurt the cider, but I like to use the leftover apples to make applesauce. If you are making apple cups, use a peeler to clean out the inside of the apple. Then use the pumpkin carving tool to even out the edges of the apple and add water to the cups to prevent browning. If you are skipping the cups, it is still great to use the peeler instead of cutting the apple into slices. They cook much faster as peels. Add the apple peels to a large pot and cover slightly with water. Then bring to a hard boil. After the apples reach boiling, reduce to a simmer and cook covered for 2 hours. Using a whisk, potato masher, or large spoon, mash the apples into a pulp. Then let the mix cool. Using a strainer, cheese cloth, or T-shirt, strain cider into a bowl. I like chunks of apple in my cider, so I used a strainer. If you prefer a smoother cider, use a cheese cloth or T-shirt and drain all of the juice into a bowl. You can then add cinnamon or other spices to taste, reheat, and serve in your apple cups. Store remaining cider in glass jars. 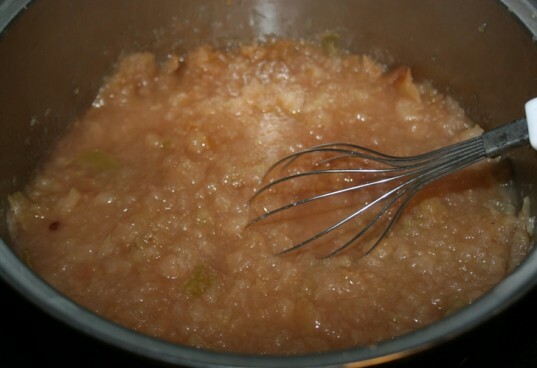 You can use the leftover apples for applesauce.